The Lobo Lab researches the neurobiological mechanisms that mediate maladaptive motivational diseases including drug abuse and depression. Our lab employs a multidisciplinary approach using transcriptional profiling, optogenetics, genetic manipulations, in vivo imaging, and behavior to study the neural circuits that mediate neuropsychiatric disease. Congratulations to Cali who was awarded a T32 training grant slot! Congratulations to Chase and co-authors on our new Biological Psychiatry paper! The lab receives a NIDA R01 on "Ventral pallidum molecular mediators in cocaine addiction." The lab welcomes UM College Park MPH student volunteer, Heather Brewer-Scotti! Congratulations to Meg and Michel for receiving the GPILS/OPS Postdoctoral Scholar and Postdoctoral Service awards! Eric Choi, Biochemistry and Molecular Biology PhD Student, joins the lab! ​The lab welcomes visiting PhD student, Marco Pagliusi from State University of Campinas, São Paulo, Brazil! The lab receives a US-Israel BSF award with collaborator Yonatan Kupchik at Hebrew University of Jerusalem. The lab welcomes volunteer and recent UMBC graduate, Qulsum Mirza, and visiting PhD student, Gessynger Morais-Silva from Dr. Marcelo Tadeu Marin's lab at São Paulo State University-UNESP/Brazil! The lab welcomes Biochemistry and Molecular Biology rotation student Eric Choi! The lab welcomes PhD Student Israel Garcia who is visiting from Dr. Sergio Iniguez's lab at University of Texas El Paso! Congratulations to Michel winner of the J. Tyson Tildon award for outstanding Postdoctoral Fellow! The lab welcomes summer PRISM medical students Torrance Wang and Michael Hong, UM Scholar student Shavin Thomas, and PIN rotation student Andreas Wulff! Goodbye and good luck to Brianna Evans who is leaving to start her MD/PhD at Penn State University! Congratulations to co-first authors Michel and Meg who published a Preview in Neuron. The lab receives a NIDA CEBRA grant! Congratulations to Meg for receiving a NIMH NRSA! The lab welcomes Postdoctoral Fellow Shannon Cole and Program in Neuroscience rotation students Houman Qadir and Miriam Menken! Congratulations to co-first authors, Ramesh and Michel, on our Neuron publication, "Drp1 Mitochondrial Fission in D1 Neurons Mediates Behavioral and Cellular Plasticity during Early Cocaine Abstinence." Check it out here. Congratulations to Chase and co-authors on our Molecular Psychiatry publication. Congratulations to Ramesh and co-authors on our Journal of Neuroscience publication. The Lab welcomes new Lab Assistants Makeda Turner (UMBC undergraduate) and Paul Henderson (Johns Hopkins undergraduate)! The lab welcomes PRISM UMSOM medical students, Maddie McGlincy and Chris Schiefer, and UM Scholar undergraduate students, Emily Larkin and Rae Herman! MKL receives a Presidential Early Career Award for Scientists and Engineers (PECASE) form the Obama administration! The lab welcomes PIN rotation students Utsav Gyawali and Jack Hussey! The lab welcomes Postdoctoral Fellow Meg Fox! Congratulations to Ramesh on his BPS paper acceptance. Congratulations to Amanda Chow for her poster win in the Neuroscience and Cognitive Science category at UMD College Park Bioscience Day for her summer work in our lab! Chase leaves the lab to start his Postdoc in the Bonci Lab at NIDA IRP. Good luck Chase! MKL receives an IMHRO/ Janssen Rising Star Translational Research Award. Chase's successfully defends his PhD! Congratulations Dr. Francis! The Lab receives an NSF award with collaborator Fow-Sen Choa at UMBC. Shweta leaves the lab for medical school. Good luck Shweta! an honorable mention as a finalist for the Sizkind-Somerfeld Research Award. The lab welcomes summer UM Scholar students Julia Bazzini, Amanda Chow, and Alison Gaynor! The lab welcomes Gettysburg College undergraduate Miranda Fennel! Congratulations to Chase, 2015 GPILS Otani Memorial Award winner!! 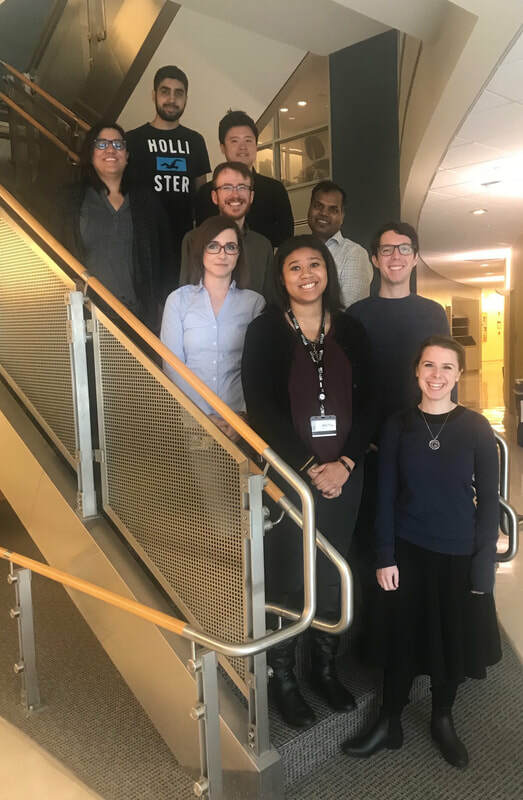 The lab welcomes Johns Hopkins undergraduates Alex Serafini, Shams Haider, and Jessica Kang and UM College Park undergraduate Reethika Maddineni. Congratulations to Chase for receiving an SFN travel award! The lab welcomes Research Assistant, Shweta Das. The lab welcomes PIN rotation student Kara Cover. Congratulations to Ramesh and Michel for winning the Postdoc poster prizes at the Program in Neuroscience retreat. The Lab welcomes CSUSB Masters student Lace Riggs. student Jeremy Winer and UM Scholar students Ashley La and Hyunjae Kim. The Lab receives an NIMH R01! Congratulations to Chase for runner up poster prize at the Winter Conference on Brain Research in Montana! The lab welcomes PIN rotation student Alex Klausing! and Graduate Student posters at the Baltimore SFN Chapter meeting at Johns Hopkins! MKL awarded her first NIH (NIDA) R01. Congratulations to Chase on his paper acceptance to Biological Pyschiatry! Congratulations to Ramesh on the birth of his daughter! The Lab welcomes UM Scholar summer student Ashley La! The Lab welcomes new Postdoctoral Fellow, Michel Engeln!